It’s a true fact that the more you attend a club, the more likely you will remain interested in the hobby, especially as different topics are introduced, people get together and become enthused in moving the hobby forward, making good friends along the way whilst getting involved in what is a fantastic hobby. The more you attend, the more you’ll enjoy yourself..!! Sheffield Wireless is incredibly grateful to Sheffield’s Rutland Hotel who very generously offer the very warm and cosy Dovedale and Panel Suites for our meetings. Such hosting enables us to offer FREE memberships and no subscription fees and where we have access excellent facilities to not only a meeting/lecture room, but also a training room, a bar, free WIFI and very welcome staff who appreciate our custom on the Wednesday nights. We particularly welcome visiting members from other clubs in the wider area including Humberside, Worksop/Notts and Derbyshire whose clubs meet on other nights. This is a great way to work on developing some excellent friendships and inter-club activity and boosting competition whilst enjoying good natured fun and camaraderie that the hobby brings. Where else in Sheffield can you get warm facilities at no cost? All we politely ask you to do, is repay the hotel’s generosity by getting a drink from the bar and some occasional snacks. Some members regularly buy a delicious meal, as it saves time cooking at home after work, so don’t be surprised during a social chat, a waiter drops by with a burger, or a fish pie or hunter’s chicken for a member… Here’s a link to their menu…. Our next meetings on the 1st and 3rd Wednesdays include a talk on building a computer for amateur radio use, a history of commercial amateur radio equipment as well as HFDX for beginners. We also continue to enjoy very good social evenings on the 2nd and 4th Wednesdays, and recently had visitors from the Yorkshire Scouts Movement to talk about activities at their local events throughout the year as a way of engaging more people to become involved in the hobby. Currently, thanks to the support of Ian 2E0IEB, 5 students are learning the Foundation licence, including Jake who himself faces the challenges very positively of being a student who is blind, and has a very keen interest in the hobby, even recently the jammy so and so took first place in our recent ‘Fox hunting’ radio exercise where we look for a signal generator that is hidden in bushes, by using handhelds to find the signal and find the object hidden in a ‘cuddly toy’, so fortunately, it’s not real fox hunting. 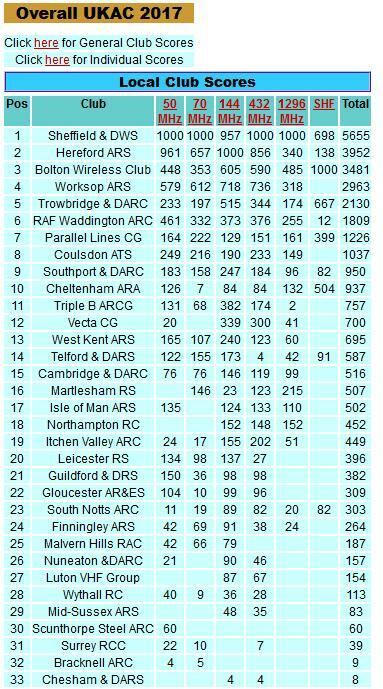 Radio Contesting and our Club Successes..
Sheffield Wireless also very proudly take the number ‘1’ lead in the UKAC contests for local clubs. There are currently 33 clubs in the league, but we are beginning to fall behind on the 2m slot, so if you have access and want to join a winning team, then join in and help boost our scores. Members have made a terrific effort this year where in August we got second place in the RSGB 432MHZ low power contest a few weeks ago. We best not forget to mention that SDWS finished in 6th place in a long list of 104 clubs this year. The Super League takes into account results from both HF and VHF contests, as shown in the accompanying screenshot. In a few of the contests, we worked in teams of four ops per team. 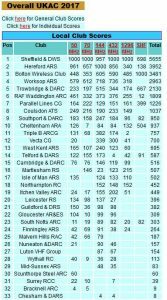 Last year we finished 9th so this is excellent progress against the top contesting clubs in the UK. It’s great to have a bunch of local amateurs, some with years of experience, and some new to the hobby; it goes without saying that contesting really does encourage you to fine tune your stations, your antennas as well as operating technique. Sheffield Wireless recently had a visit from Stuart G6DUE at Sheffield and the wider Yorkshire Scouting Movements with a view to getting involved with a variety of local Scouting events over the coming year. 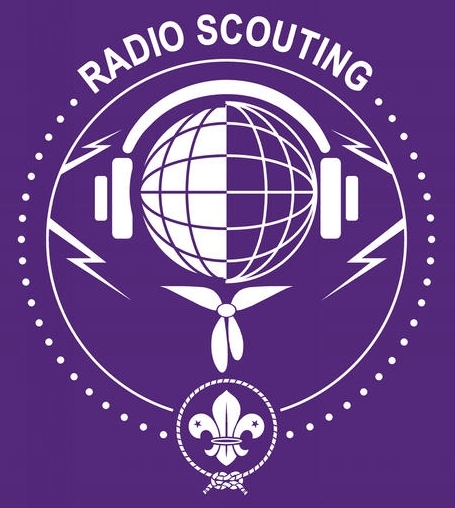 These are early days to ascertain which members are interested in getting involved in supporting the scouts, and deciding what can be realistically achieved within those weekends. It’s a great way of getting involved in the hobby, and engaging new members to join in and have fun. Come along and join us at Sheffield Wireless, where it’s warm, a great bar, good food, good company and good conversation. Come and share your ideas, let us know how you’d like to be involved. There’s no need to sit out in the cold, when you’ve got FREE membership, no subs, and a great opportunity of immersing into what is a fantastic hobby to enjoy. See you soon at the Rutland..! !